Montez is the new queen of her land of Khemmis, somewhere near ancient Egypt, because her father has been assassinated. She is determined to discover the perpetrator of the dirty deed, and her unctuous chamberlain, Zucco, suggests that the crime was committed by Bey, leader of a pack of recently escaped slaves. Montez believes Zucco (not yet knowing that it was Zucco himself who actually did the deed) and doffs her royal robes in favor of peasant gear in order to masquerade as a civilian and personally wreak revenge on Bey. She thinks she can trap Bey and take his life, and Zucco is all for it, hoping that she will somehow get killed out there so he can assume the throne. On the off-chance that she might actually survive the rigors of the desert, Zucco takes no chances, hiring Warwick, a slave trader, to kidnap her and dump her body out where the camels roam. Montez, however, is made of stronger stuff and manages to escape her fate with the help of Hall and Devine, two itinerant Egyptian hobo/pickpockets who also steal horses when they can find a willing buyer. Devine and Hall don't know that Montez has the blue blood of royalty pounding in her lovely veins and treat her as they would any woman on the run: with humor and a touch of disdain. Just when it seems they've gotten away, they are recaptured by Warwick and his henchmen. Their deaths are imminent when Bey, at the forefront of his band of slaves, sweeps into the village where the executions are to take place and saves them all. Montez appreciates Bey's intervention but is still convinced that he was the man who slew her beloved father, although she doesn't tell him that. The group returns to the capital city and, once there, Montez reveals her power and has Bey thrown in jail. No sooner is that accomplished than Zucco shows his true colors and marshals his powers to have Montez tossed in the same prison. Hall and Devine have watched Montez and Bey and realize that the two love each other. They manage to break Bey out of jail, then all flee to the mountains, where Bey has been gathering his forces for an eventual assault on Zucco's army. 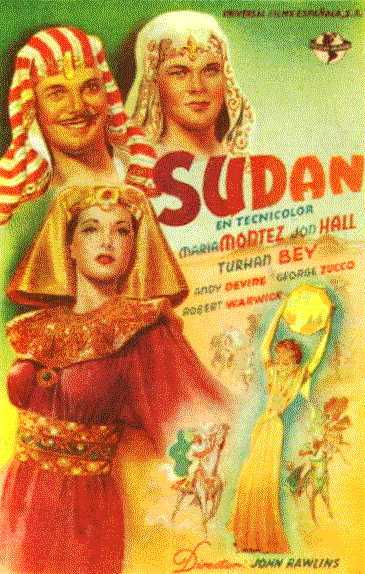 Zucco then uses pain to extract the location of Bey's headquarters from Montez and takes her and his men to the hideout. In a spectacular finish that sees Montez miraculously spared, there are several thousand rocks just waiting to be released on anyone who comes that way; Bey lets the boulders fly and the advancing evil-doers are crushed into fodder. This time, Bey gets the female star and Hall is only used as comedic counterpoint with Devine. After this film and in the whole 1945, the beautiful image of the Queen of Technicolor would not be seen again, because the actress had conflicts with the Universal due to her demands of roles of a better quality and of a better salary for her work.